I've created a voice app which I've named SIMCOM X. More information on the app can be found at https://dotdash.space. This came about as I could see pilots from other groups fly past, but I had no way to contact them. I also knew of ATC who were sat twiddling their thumbs with one group, while another group were begging for a controller. Simcom X is built to run alongside existing voice apps, not replace them. That said if it works well for your group, there is nothing to stop you solely using SIMCOM X, which is why I added the Group mode feature. 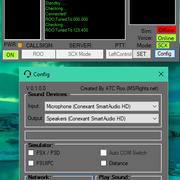 If your group uses Teamspeak or Discord now, you are able to also run Simcom X to connect to the SCX network and then tune to the same frequency as pilots or ATC from other groups should you wish to. Tune to the Unicom 122.800 and see who else joins you. You see another aircraft in JoinFS and have no way to say hello. What group are they a part of? What voice client are the using? What channel are they in? If you are both tuned to a Unicom, you can say hello. Have you ever been chatting to your friends in your groups general Teamspeak or Discord channel, but then you have to stop the conversation in order to move to the ATC channel? Run SIMCOM X in the background and use it to speak to ATC, whilst carrying on your conversation in Teamspeak or Discord. Have you ever acted as ATC and wished you could say "Contact Departure.... 123.450" or another airport/centre etc? because there's another controller there (maybe not even part of your group). Just a few reasons to give it a go. Even if you just leave it running in the background in case a passer by wants to say hello. The closer you are to another station, the better the Audio quality. Too far away and you won't hear them at all. When the aircraft radio stack is tuned in FSX/P3D (SimConnect) or XPLANE and FS9 (XPUIPC/FSUIPC), you will automatically move to that frequency in SCX. Can ALSO be used without autoswitching. Can be used as standalone with no sim running. Can be used while existing voice apps are running. For example chat to your friends on Discord/TS3 whilst communicating with ATC and other pilots on SCX. SCX Network and Group Mode. If using Group mode, give your friends the IP displayed in your client which they can input to connect to you. If using SCX mode, the client will look for other clients on the same frequency and then connect to them automatically. SCX mode will also show which ATC is online using Simcom X and what frequency you can contact them on. Play a sound on Frequency switch. So you can run the app in the background and know you have switched. Play a sound on TX or RX. This might help people to stop talking over each other. This helps those that get the occasional stuck PTT issues. Able to mute any other client on the same frequency. Helps to stop the music players. Helps you to see if you are transmitting or receiving when the app is minimised. You may need to show hidden icons or set the icon to always show in your Taskbar. Checks for updates on start-up. Ports don't need to be opened if your router supports Upnp and it is enabled in your router. ATC using SIMCOM X Show on the Map. If you are acting as an ATCO your position will show on the main JoinFS map along with the frequency you are using, so pilots know you are active and how to connect to you. Test if your port is open correctly/firewall issues. Specific ATC client to allow coordination between controllers. I've posted it here so that people can try it and let me know the bugs. This is the first version, its BETA, THERE WILL BE BUGS. P3Dv4 users will need to install the Simconnect version in the XPACK folder. Thelatest 4.72 .net runtime may also be needed by some people. 1. Run the installer so it's installed (always a good start). 2. OPEN UDP PORT 9988 in your router/firewalls, so clients can connect to each other. If you're not sure how, tick the Upnp option in Simcom X and check that Upnp is enabled in your router. 3. Click the black headset icon on the desktop to open. On first run, Windows will ask if you want to add a firewall exception. You do, otherwise others can't connect to you. 4. Once opened hit the config button and select the sounds, network etc that you would like to use. If you are acting as An ATCO, select the ATC box and you will show on the list in SCX mode. Once configured and PTT is set click the PWR button on the bottom left. I'd be grateful if people could test and report the issues. When Join Group Server is selected you should be able to enter an IP into the Text Box and connect to another person who you know is also using Simcom X (The Group mode feature). If you select the Host Group Server box, you are the host and it will show your IP in the Text Box above. You can then give this to others so that they can connect to you. Only one person (the host) in the group needs to have the Host Group Server box selected. The other users should have the Join Group Server box selected and input the IP of the host to connect. If SIMCOM X Mode is selected. When the frequency is changed in the Active Freq box, it will look for and connect to others using the same frequency as you who also have the SIMCOM X box selected. If the Simcom X box is selected and ATC mode is ticked, you should show in the ATC box on the main screen after a few minutes and the main JoinFS map. If you are not using the autoswitch feature, you can tune the standby box and click the arrow to make the frequency active. It should only allow frequencies to be entered correctly. 6 digits with a decimal place. If you do try the autoswitch feature you should no longer be able to press the button from standby to active and you should switch frequencies as they are made active in your flight sim. Both COM1 and COM2 radios are supported, which ever is your ACTIVE TX box in the sim will be the frequency Simcom X uses. Callsigns for pilots should be either a registration (ie GABCD or N1234M) or callsign with a trigraph (ie BAW123 OR AAL123) which helps ATC, although there is nothing to stop you using your name (Bob etc). ATC should set their callsign as the ICAO_POS (KLAX_TWR or ESSA_RDR for example). As the ATC callsign shows in the ATC box and pilots can see the airport and position active. If you set Bob, nobody will know where you are controlling. Let me know how it works for you and if you think its of any use. I can only fix the issues that I know about. Last edited by ATC Roo on Tue Apr 16, 2019 8:30 pm, edited 21 times in total. I found an issue already. So pulled it before everybody installed the issue. I'll post the correct version shortly. Last edited by ATC Roo on Sun Nov 11, 2018 2:18 pm, edited 2 times in total. If you have the time and like the look of the app, please do try it and let me know. If I don't know of issues I can't fix them. If I don't know there are no issues I'll keep looking for them. installed program. all looks good. started P3DV4 in MP, then comm program. see pic. can't get the "sim" light to turn green! I'll take a look shortly. I see you've set a Joystick/gamepad button for the ptt. I see the "TX" light come on and hear the mic click, bot to voice in or out. Also the mick click i coming through my speakers, I would want the comms via my headset. oldpop wrote: I see the "TX" light come on and hear the mic click, bot to voice in or out. Also the mick click i coming through my speakers, I would want the comms via my headset. I've only been able to test with a 2.5mm Jack headset, which is what I have. Are you using a usb headset? If you haven't already, try having the headset plugged in before starting the app. I should be able to add a drop down menu to the config page in order to select sound device otherwise. Let me get the auto switch back up and running and I'll have a look. Autoswitch should now be fixed! Switch with FSX/P3D when the autoswitch box is selected. Run the new installer and it will update the last version. Getting better!Autoswitch works. When I am hosting (MY IP IN IP BOX), in sim(p3dV4), TS3 running, all lights green, freq displaying as in a/c, can hear "clicks"(on speaker) all looks good, but don't see other member on line, nor can he hear me, or I him(tx light ok). I don't see him in left window. he has my IP in and on same freq. site will not allow me to att the log files in any format??? Last edited by oldpop on Wed Apr 04, 2018 3:36 pm, edited 1 time in total.